Ho ho ho! 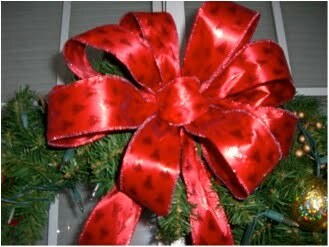 So, Let’s Learn to Make a Holiday Bow! When I was growing up, my grandma owned an adorable flower shop in Roseville, Michigan called Lou-Ann-Dors. It was an immaculate, yellow-shingled house off of Gratiot Avenue that always smelled of lilies, fresh leaves, and coffee. The business’ name was a compilation of the three Lafevre sisters: Lou Lou, Annie (my grandma), and Dorothy. And just as a mechanic passes on tools and tricks of-the-trade to his son and then grandson, some of the “craftspects” of the floral business were passed onto me. One of these skills was making holiday bows. In our house, the plastic, porcupine-shaped bows with the sticky backs that came in a plastic bag of 24 were a no-no. My mom would spend a great deal of time turning sparkly wired tulle strips into billowing bows that would trump the packages they rested on. Now that my life is wild busy, I rarely bust out the bow making, and when I do there is frustration (they say the first thing to go is coordination). I just try to find the most beautiful wrapping paper around (um… Papyrus and Target) and feel proud when I hide all of the tape on the package. I notice my mom doesn’t really do bows much anymore either (it’s alright mom, I still think you are the best wrapper (no mom, not rapper) that I’ve ever met). I tell you though, nothing adds the finishing touch to a package like a gorgeous bow. They add anticipation to the presentation. Plus, gigantic bows make fab tree-toppers and really covers up less-than-stellar wrap jobs. So, recently I came across this short video on YouTube from “Ask The Decorator.” If only I would have known all along that bow-making was as simple as this video! I felt like my mom and grandma showed me the ‘authentic” way to make a bow–just like someone authentically makes cream using an old-fashioned churn. Ha! So, I wanted to pass it onto you. CLICK HERE TO LEARN HOW TO MAKE GORGEOUS, SIMPLE BOWS! 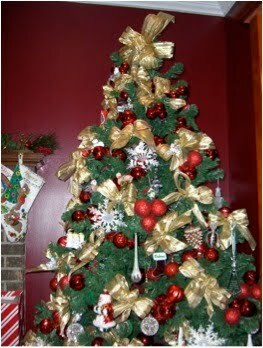 Any holiday decorating tips you would like to share? I would love to hear and as always, keep counting. That us a great video on making the bows.As I get older I don't take the time I used to on decorating packages. But I still love to look at beautifully wrapped gifts(and get them too)One tip I would like to pass along is decorating with greens, whether they be fresh or artificial. Using greens under any Christmasy item makes it look special. So instead of just setting that santa or sleigh on a table- put some greens near or under it and it adds so much. Use vases filled with sparkly bulbs all over the house and bring out all your candle holders no matter what size and group them on your table. It looks awesome. Happy decorating. When I was around 10 or 11, my mother took my sister and I to the "Southern Women's Show" in downtown Nashville. This conference has all the works- fashion shows, cooking demos, product launches, AND a bow making kit booth. 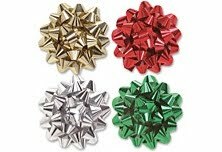 It was there that we purchased our bow tools to forever change the way our gifts look under the tree. Til this day, my mother takes pride in hand-making the most elaborate, gorgeous bows. Tip: Wired ribbon works best.